For the 5th time the Miss ECO International pageant wil be held. Since 2018 the licence for this pageant is with Vicky Zimmerman of the Vicky foundation and the Miss and Mister Avantgarde pageant. Last year the always so friendly Judith de Wilde de Ligny represented the Netherlands. The first Miss ECO Netherlands was the statuesque Talisa Wolters who became 1st runner-up. In 2016, Laura Ghobrial was one of the big favorites to win the pageant but sadly just made the top 10. Beautiful Floor Masselink represented the Netherlands in 2017. This year Maritte van Hoven will fly to Egypt to battle for the Miss ECO crown, designed by BaroQco after she won the Miss ECO Netherlands casting. Who is Maritte van Houten? My name is Maritte van Houten and I am 21 years old. Currently, I’m in the third year of the study of becoming a veterinary nurse. In the weekends I am working at a watersport company and I also do some modeling work. In my spare time you can find me with the horse I take care of and in the gym. When did you enter the world of Beauty Pageants and why? Miss Beauty of Gelderland 2017 was my first participation in beauty contests. I signed up for the beauty contest because I think personal development is very important and I thought this was a great way to develop myself. And that’s true! Through my participation in the pageant I gained more confidence, I learned how to present myself in front of a large group of people and much more! Why did you decide to enter the Miss Eco Netherlands 2019 pageant? Miss Beauty of Gelderland has been a very positive experience for me. That’s why I wanted to participate in a beauty contest again. Miss Eco immediately appealed to me because I grew up quite ecologically. How are you preparing for the international Miss Eco International 2019 pageant? In preparation for Miss Eco International 2019 I train every weekend together with miss Eco Aruba 2019 and Miss Eco Curaçao 2019. For example, we get catwalk training, a make-up workshop, presentation training and much more! Miss Eco International is not very known to the dutch people, what will you do to make this pageant known in the Netherlands? 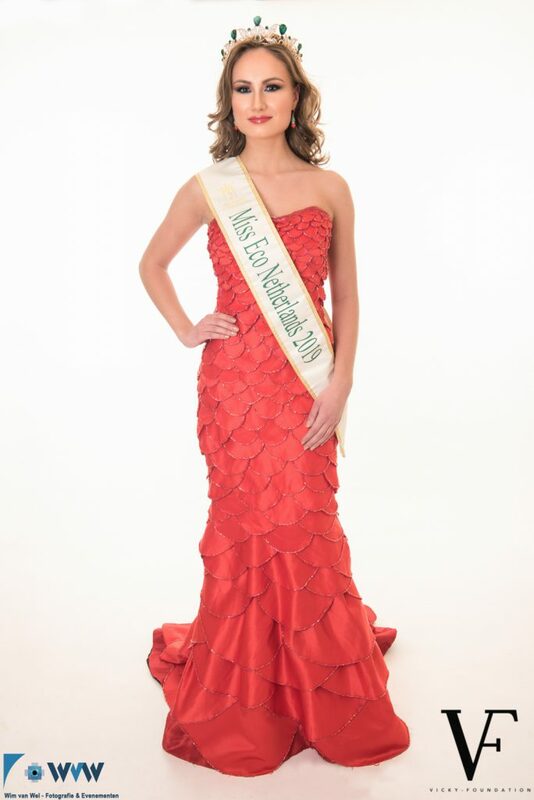 To promote Miss Eco in the Netherlands I will use Facebook and Instagram a lot. In addition, I will also give interviews on the radio and in the newspaper. How do you live your life ecologically? And what will you tell the other contestants about how ecologically the dutch people are? Yes, I live reasonably ecologically. At home we use solar panels, we separate our waste, my sister has her own vegetable garden and I have my own chickens from which we get organic eggs every day! We also try to use the bicycle as much as possible instead of taking the car! This is also a typically Dutch thing! For example, the Nederlands has a bicycle plan for employers. Through this plan they can give their employees compensation for their traveling hours when they come to work by bike! A good incentive! What do you hope to learn at the international pageant, what you will take with you for the rest of your life? I think this is a journey I wil never forget! Not only because I have the honor to represent the Netherlands. But also because I can get to know new cultures, new people, and new experiences. Who will design your ECO costume and your resort wear costume? Duc Nguyen is the designer of my resort wear. He has a style that combines business and modest. The designs of Duc show many influences of his asian background and the influences of western romanticism. David Cardenas is the designer of my eco dress and national costume. He has his own beauty contest which is Miss and Mister Avantgarde! He has won various titles in the field of national costumes abroad. I think it’s an honor that they want to design these outfits for me! I won’t tell you anything about the designs yet, I think it is much more fun to keep it a surprise until the finals! What are you looking for the most to see in Egypt and why? I have visited Egypt a few years ago. I think it’s a beautiful country and I’m looking forward to go there again! I hope we will learn about the history of Egypt during our trip! I expect it to be a very nice experience and I cannot wait to tell all the stories when I come back! In 10 years, I hope to have a successful career as a model. I would also like to continue studying. I want to learn as much as possible because I want to become the best version of myself. Thanks Maritte for these 10 answers we would like wish you all the best of luck at the Miss ECO pageant. We would also like to thanks Vicky Zimmerman for her time and want het to wish also all the best of luck!